Do you ever wish you could change and transcend the limitations of the body you were given? Phos' journey in Land of the Lustrous (Houseki no Kuni) is a compelling exploration of a person who desires to change themselves, both physically and mentally. Studio Orange's adaptation of Haruko Ichikawa's manga is unlike any anime you've ever seen. Stunning CGI, visceral yet graceful nature to which it portrays bodies, and a dense analysis of the human condition make it unforgettable. In the distant future, Earth has been ravaged by six meteors. The meteors broke off parts of the planet and formed six moons. Earth has been reduced to one single shore and the rest of the planet is the ocean. This single shore is, while beautiful, has entirely infertile land. Only one organism populates the land because they don't eat food from the planet, they photosynthesize. Evolved from the organisms that live in the depths of the ocean, they became beautiful gems who reflect sunlight with every move they make. Creatures that live on one of the moons known as Lunarians travel down to Earth to capture the gems for their own personal desires. The prettier gems being the most desirable. As long as the moon hangs above the characters' heads there is a constant feeling of fear for their lives, in turn creating constant tension for us as viewers as we can never be sure if a character may be swept away or shattered into pieces (and no amount of perceived plot armor will stop them). We constantly see a full moon in the background of the show with gems framed below its vastness as if it is preparing to encroach upon their temporary safety. Land of the Lustrous tells the story of the youngest of the 28 gems, but they’re all immortal so being younger than a thousand-year-old being is still quite old. Our main character Phosphophyllite brought to life by Tomoyo Kurosawa’s exquisite performance that is able to get to capture such a wide range of emotion and tone, is inherently relatable thanks to a lack of seriousness and plenty of recognizable mannerisms. Phos ranks near the bottom of the “Mohs Scale” used in real life as well, which dictates how high or low a gemstone’s hardness is on a scale of 1-10. In the society they live in, if you’re born with a low hardness then you have no choice but to take on a role suitable to you, but if you have a high hardness you’re expected to protect the others in combat. And because they’re immortal, roles are permanent. Unchanging. It’s a roulette that’s spun for the gems, spun for us all. It doesn’t matter what body you get because you’ll be stuck with it. It’s up to you to decide what to make of the body you’re given. However, Phos is so useless in their society that they fill no niche or role. Thanks to their upbeat and irreverent personality they’re able to live optimistically, if pointlessly. It's a stark image of the unmotivated youth, struggling to find direction or even motivation. An image that I resonated with immediately. And more than likely you will too or, at the very least, you'll appreciate the direction Phos takes to better themself and help their fellow gem suffering from a similar struggle, Cinnabar. At the beginning of the show Phos is descending into pointlessness (almost like an actual rock), berated by the other gems for a lack of talent. They say things like “Are you good for anything?” and “You don’t do anything at all”. It’s all played off for laughs, if a bit mean-spirited, but the truth is, Phos only has a 3.5 which is so low that they’re not even allowed to fight. Phos would fall to pieces if they were shot by just one of the arrows the Lunarians use. Phos comes to hate the limitations of their body, regardless of how desirable the Lunarians find their peppermint green color. And there are other gems who envy Phos for their desirable color, of course without Phos fully understanding that they have qualities worth being jealous of. This is just one of the many ways the show incites introspection, saying that we all have some notable qualities no matter who we are. While Phos doesn’t technically break themselves, throughout the show they throw themselves into danger with the desire to be broken, hidden beneath their silly personality. Through being broken with intense physicality and repeatedly being put back together with a light but audibly satisfying sheen, Phos grows to become a new person from who they originally were. After all, if the gems lose a piece once broken, they lose an equally sized chunk of their memory. So occasionally after a battle, one of them may forget the name of the other, but in the more drastic cases later on in the show there are harsher consequences. In one of the most chilling moments of the show, Phos is beckoned to danger by an unseen force (assumably their desire) that says “You must change.” It’s that horrifying feeling we all have at one point, and Land of the Lustrous delivers fear-inspiring moments like these every now and then, but most of them come in the later episodes. These moments successfully connect the viewer to the central character and their turmoil by giving them vivid fever-dream visualizations. Phos’ journey is the main narrative throughline of the show, and thank god for that because seeing them grow and learn more about their world makes for a rewarding adventure indeed. The main character isn't the only suffering from inner turmoil. Every gem has some sort of anguish that torments them. Even Diamond, with a hardness of 10.0 who Phos idolizes, feels great envy for the slightly tougher Bort. These subtle nuances to each character aren't shoved onto us either. They’re minor details, subtly woven into the script so that the generally upbeat mood doesn't become melancholy, but it's enough for you to pick up on so it will feel rewarding to see their progression in the background of Phos' story. Make no mistake, this is not only a compelling journey through the main character’s struggle against themself, or even about the three-dimensional supporting cast that serves as foils to Phos. It's about bodies, how they deserve you to live in harmony with it rather than in spite of it. Bodies are treated as sacred totems in Land of the Lustrous. To place them in the purest form possible, gender is removed entirely, each gem referring to the other with they/them pronouns only (as I have thus far). They’re quite literally artifacts that glisten in the sunlight. The gems are constantly framed with vast negative spaces to highlight how valuable their beauty and vibrant color is to the desolate world they grace by inhabiting. Also, the director repeatedly frames the gems in symmetrical shots as if they are the focal point of a work of art, hanging in a fine art museum. Even the more enigmatic supporting characters like Bort and Antarcticite are portrayed with beauty and elegance through their immaculate fighting style that each gem uses. The fighting choreography appears as graceful as a ballet dance but has the visceral impact necessary for them to take on a fleet of eldritch creatures. The action is unlike anything you’ll ever see. And it’s brought to life amazingly with the most stunning CGI I have ever seen in a TV series. The previous works of the director Takahiko Kyogoku includes another CGI oriented show (Love Live! School Idol Project) and it really shows because he’s improved on that show’s animatronic dance numbers in just about every way. Action scenes are where the director shows us his best abilities, and they only get more impressive as the show progresses. The “camera” work during action scenes is so dynamic. The smooth camera motions coupled with the fluid movements of the characters makes for scenes that devour your attention entirely. Even during the scenes with less motion, the gems are still quite vibrant. Their vividly colored hair and reflectiveness that causes light to bounce off of them makes the show, at the very least, always eye-catching. The respect that each gem’s body is treated with makes it all the more distressing when they’re shattered in combat. This, coupled with intense visual and audio feedback, makes the combat to be some of the most thrilling action I've ever witnessed. Even though the gems are immortal, there is still a fear for their lives, if they are broken and become immobile then they will be trapped in their bodies forever. Endlessly. Arguably that is a fate worse than death. Even worse, the Lunarians may repurpose you into a weapon or jewelry (as seen in episode one). The orchestral soundtrack backing most scenes maintains the mystifying tone of the show and is fantastic throughout. Music swells during combat and during some scenes, it matches the instruments the Lunarians play when they come down to capture a gem. Sound effects are also incredibly satisfying on the ears; the sheen of a gem being put back together after a tough battle, the airy wisps of the cloudlike Lunarians, the clinking sound that can be heard as gems walk across the marble floor of their home. Lustrous is never harsh on the ears yet it has an intense audible impact. Both the opening and ending credits are quite good. The ending Kirameku Hamabe especially shouldn't be understated. With fear-inspiring images of the moon, the poison metal alloy that flows around Cinnabar, as well as a few references to the later turns the story takes, the ending perfectly encapsulates the darker themes of the show. To contrast this, the song that supports the visuals evokes hope. Beyond just being an audio-visual wonder, Land of the Lustrous is an analytical masterpiece. The director brought excellent talent to the table, but the source manga by Haruko Ichikawa deserves credit for being rich with symbolism. Thankfully, this carries over into this compact but well-paced adaptation. Not a second of screentime is spared. When we’re not being delighted with the funny and whimsical script, mesmerized by the visuals, or sometimes all at once we’re being delivered the themes through visual imagery. The thematic throughline in Lustrous follows the idea of change. The changing of one's self, the change that Phos and their fellow gems desire. As such, concepts like death and rebirth are constantly showcased with symbolism. When are gems are broken, they’re placed in black bags that strangely resemble body bags. It’s as if they’ve died are being remade once the doctor puts them back together. This intrinsic connection the show shares with death also explains why each gem wears a black tuxedo resembling funeral attire. As if they're all in a constant state of mourning for the pieces of their comrades (and selves) that are lost in battle. The show is also doused in Buddhist imagery at nearly every corner. Whether it be the enigmatic “Sensei” that all of the gems respect and rules over them like a deity, the ritual-like behaviors and designs of the Lunarians, and the frequent references to rebirth. If you know about the Buddhist philosophy, you’ll know the goal of the religion is to relinquish the body that carries your soul so you can be liberated and proceed on to Nirvana. There’s even a scene in which a certain character is supposedly reborn as a small animal to more suit the karma that they obtained in life. It can’t get any more clear than that. But in action, like everything Lustrous does, the results are absolutely mystifying. Seeing all of these different concepts clash together with great visual quality and artistic direction makes for one of the most bewildering yet beautiful experiences ever. No details added to Lustrous were done so without reason, everything is purposeful. Everything is necessary. It may have helped that I was learning about Buddhism in tandem with Lustrous’ tv airing, but knowing of these themes definitely enriched my experience. Keep in mind, there are many interpretations with such an abstract and ambiguous story like this one, so you may find different meanings in the show from the ones I did. Before closing, it's worth mentioning that as the source material is still ongoing, this anime does not have a complete ending. Enough plot lines ended on a satisfying (if incomplete) note, and a few new ones were opened to give you a sense of the direction of the next season will take. The story is not over so I will be patiently awaiting the second season, but until then I’ll be happy to dig through the show’s lore and alternate meanings as there is plenty of rewatch value. Land of the Lustrous is, for the most part, a joyful adventure that may even inspire laughs, but let your guard down too long and the Lunarians will steal away all you hold dear leaving you devastated. At its heart, it is a pure and simple story about how impossibly flawed we are as people. How we'll always search for means to become better, endlessly until we finally reach the end of the cycle. Whether or not this series has all of the answers, you'll want to listen to the tale it has to tell about the questions. Absolutely beautiful, Houseki no Kuni sadly flew under the radar of a lot of people due to the lack of initial hype, but I hope this changes over time because this anime really deserves a lot of love. The setting is so interesting and full of mysteries and unknowns to discover, what happened to the world to become like this? Who are the gems, or the moon people that seem to be after them? Houseki knows how to make the events ocurring hooking to watch and it's such an enjoyable experience from start to end. Along with the intriguing story we also have a fantastic cast that brings it life, the characters are inmortal humanoid gems with the qualities that represent them (like Diamond being the hardest mineral, but relatively easy to break in comparison), their interactions are interesting, varied, and at the same manage really funny when the situations requires it, this anime handles very well the comedy and it fits nicely without breaking the mood of the scenes. Phosphophyllite (or Phos in short) is the protagonist and goes through fantastic development over the duration of the series, becoming a very memorable character. Now it's time for the art department and I will be honest here: if every CGI anime has to look like Houseki, god, I want so many more of them! The animation is amazing and had some scenes where I just had to replay them of how good they looked, and the excellent cinematography that goes with it just makes it even more impressive, with some shots that left me speechless. The use of this type of animation is also really fitting considering the constitution of our characters and for details like how they can break depending on the situation, which looks better with this style. The music is also a strong factor of the series, always fitting with the tone of the scene and improving them, the theme that plays when the Lunarians appears gets an special mention from my part because it never failed to make me shiver, so unsettling. The opening and ending themes are also great in both song and visuals and grew on me as the series progressed, definitely playlist worthy. Houseki no Kuni was an unique and fantastic experience I really recommend everyone to try out, you won't regret it. The GRRM Reaper once posited the Furniture Rule: that at its core, literature is an exploration of the human condition; the rest is fluff, furniture. Houseki no Kuni begins as a simple story of immortal, genderless life forms, the Gems, with each individual based around a gemstone from which they take their physical characteristics. They are being hunted down by Lunarians for what seems to be collector’s fancy. Slowly, the story moves on, teasing the layers of mystery of its world and a more intriguing aspect of the entire dynamic unravels, one more conducive to philosophical discourse. The introduction of a third faction, the Admirabilis, elevates the nature of their conflict and is poised to bring the series higher should its story continue. The CGI nature of the show doesn't really take away anything from the narrative but rather enhances and prepares it with its CGI portrayal of the three factions telling a story: the Gems, with their janky yet solid movements, aimless and unmotivated beyond mere survival; the Lunarians ethereal and eternal, purposeful in action; and the Admirabilis, frills and filaments galore, excess made manifest, seductive and ephemeral. Underneath the trappings of a fantastical concept, however, Houseki no Kuni is a thesis of how our place in our world is intricately intertwined with our purpose. It's a story about identity. It's a story of Dia, valued, vaunted, a tier above other gems, yet struggling to find a moment in the light under the vast, dark shadow of a peer better and stronger. It's a story of Cinnabar, self-exiled, isolation poisoning the mind, bereft of a shoulder to lean on. Most of all, it's a story of Phos, aimless slacker, wanting to do more than just making an encyclopedia that has no equivalent value assigned by other Gems. Phos wants to fight, swept up in the idea that Gems prove their worth in the only way their circumstances allow: fighting the Lunarians. Phos' initial value was demonstrated when, devoured and broken to bits and pieces, the grim, though temporary, fate evoked nothing but cruelly nonchalant reactions from fellow gems. How can someone so brittle prove their value when, to paraphrase Einstein, the fishes are judged by their ability to climb a tree. Houseki no Kuni’s approach to the problem is a rather straightforward one. Instead of changing the playing field to a pond, our little fish is given an opportunity to be better, losing parts of itself in the process. Part of its identity must give, in the hopes that the best version of itself can be achieved. And that hopefully the best version of itself is its truest self. Whether it’s true or not remains to be seen. And I must say, this conflict of identity and the show’s solution ties in fully with the larger, grander aspects of the narrative: the three factions, each crucially lacking traits the other two possess. Can the three factions be so much more together much like how Phos had become much more than the Mohs scale of hardness? We'll see. For now, enjoy one lost little fish trying to scale a tree, struggling to find the right balance lest it loses sight of who it is. Over the last few years or so, it seems that the discussion regarding the use of CGI in anime has grown all the more prominent, and for perfectly good reason too. It appears that more and more shows are using CGI to greater affect, which is generally brought with much disdain with anime fans. For shows that use CGI in accordance with the use of traditional 2-D animation, the end result is usually one that comes across as jarring, as the two modes of animation juxtaposes awkwardly with one another, with scenes that end up feeling clunky or strange. It usually ends up dragging me out of my immersion of the show, since it doesn’t make visual coherent sense, and often the CGI sticks out look a sore thumb, with this season’s Inuyashiki being a prime example of that, constantly intermixing both modes of animation haphazardly into its action sequences. With shows that are fully CGI, this jarring contrast is pretty much eliminated, but many suffer from poor production overall since the CGI is often rather ugly looking, with the two recent adaptations of Berserk being the king of this! Both shows feature some of the most poorly produced CGI action sequences I have ever seen, where most of the time it looks like two puppets awkwardly rubbing up against each other instead of them fighting! And there are many other shows like this too, so it’s no wonder why fans look at CGI with such disdain and actively try and avoid any shows that utilise it, which is perhaps why this season’s Houseki no Kuni, or Land of the Lustrous if you will, was so under looked within the community, which is a shame too, since, to make a frankly overused and terrible pun, Houseki no Kuni is the gem of the season! Much to mine, and many other’s surprise, Houseki was a breath of fresh air, not only from typical CGI oriented anime, but for anime in general, with a wonderfully creative setting, lore and personality-filled characters! While Inuyashiki was a disappointment, Houseki is the salvation to said disappointment, with each passing episode, making me fall in love with this show all the more, and why it certainly is not perfect, provides me with a seasonal show I actively looked forward to watching each week, which hasn’t happened since Dragon Maid earlier this year. But, I’ve babbled on for too long now. Let’s actually dive in! 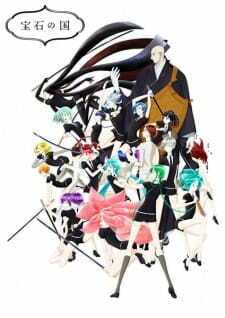 Set in the distant future, Houseki no Kuni tells the story of a group of genderless gems, all of which have differing personalities and characteristics, who, along with their master, a bald monk with insane powers, have to fight off against a race called the Moon Dwellers - a race of strange creatures who descend from said place to capture the gems! The series sees our main protagonist, Phosphophyllite, come of age in this world, slowly becoming more independent and stronger as the series progresses. Houseki has this way of immediately immersing me into its atmosphere and world, not only through its wonderful use of music and beautiful looking scenery, but just from all the little details the show provides too. The fact that each gem has specific characteristics, and are classed in accordance of their strength, the fact that they can be broken into tiny pieces and stuck back together again, that they can lose their memories if certain body parts are missing, that they have to hibernate over winter as they grow weaker and tired, and that they can potentially be combined with other elements for different affects are all things I can appreciate in making the show way more interesting and fascinating to me, and these elements are often used in creative ways for either characterisation or as elements for advancing the narrative. It’s the use of these creative elements that makes Houseki such a wonder to watch, and helps to differentiate it from much of its ilk; its these elements and ideas that I can’t get anywhere else, but they are not simply played as gimmicks either, but as an integral aspect of the setting and narrative. Additionally, the show has this overbearing sense of mystery, and almost whimsical sense to it as well. Much like our protagonist, Phos, who knows nothing of this world, so do we as an audience, so we experience the world and learn new things about it as does Phos, which not only helps us grow more attached to this character as well, but the rules and mysteries of this world are dished out to the audience in a consistent pace, keeping the narrative interesting and fresh. Moreover, the show has several mysteries as well, such as what the true nature of the Moon Dwellers actually are or the state of humanity, evident in a scene where Phos is trying to recollect the events that transpired earlier in which she (yes, for the sake of convenience I'm going to be referring to the gems as "she"; I apologise for being a CIS white male and assuming gender) can’t remember as she had lost some of her body parts, but mentions the word “human” which greatly alarms that of the Sensei, the guardian and father figure of the Gems, giving us insight into the seriousness of the memory Phos has, and sliding little hints to the audience about the true nature of the Sensei character himself. The show even dabbles in some philosophical ideas too in the fifth episode, regarding what it means to truly be human and what it truly means for someone to die, as the very concept of death is foreign to the Gems, and while it is not explored to much substantial merit, the show does throw around this idea, making the Gems feel more believable with a greater sense of purpose. There’s even a genuine sense of narrative stakes and ambiguity too, not only from the idea that we never know when the Moon Dwellers will attack next, but the general sense of uneasiness the narrative presents too. There’s always a sense of danger in the air; a sense of looming dread and fear, which permits itself into much of the narrative, which actually does a good job at making me fearful for each one of the Gems, and there is a genuine sense of sadness and melancholy when one of the Gems is defeated and taken away. You feel the weight of this loss, as the other Gems do, making it all the more powerful when these moments in the show do occur. The show does leave many questions unanswered however, and some plot points haven’t yet been resolved as the manga is still running alongside the show, but what the show does cover manages to provide a solid foundation for a second season to greatly build upon, with enough time in this season devoted to establishing the world and the way in which the gems work in said world, all of which is solid enough to stand by itself I believe. Perhaps the show’s biggest strength is in its characters and their charming and fun interactions between one another, and, despite not each one receiving development or attention, their unique personalities and characteristics result in some wonderfully funny moments and scenes which makes the characters rather likeable, and these were some of the best moments in the show for me. They all have delightful chemistry, and one of the best examples of this great character dynamic is a scene in which all of the gems freak out at seeing Phos’ newly gained abilities and seeing how each different gem reacted was pretty damn sweet, adding onto their respective characters. All of the characters, in some form or another, is given some level of introspection and time to breath, allowing the audience to understand their perspectives on the world, from Yellow Diamond’s perception as a result of being the eldest, to Antarcticite regarding her unique, and isolated role during the winter, all adding onto our understanding of the world. There are plenty of characters I could talk about, but I’ll just discuss the characters with the most bearing on the plot. Phos, our main character, is one in which is a representation of a child growing up in harsh world, and learning to mature in that time. Being the youngest of all the gems, and wanting to grow and prove herself, she eagerly jumps into action in order to do so, resulting in many accidents in which she has to either be saved, or put back together. You may find yourself kind of annoyed by how much Phos messes up at first, since it seems that almost every episode she ends up having to repeat this process, but these mistakes end up shaping the person she will become in the future and aiding her development. As the series progresses, and she realises the gravity and danger of fighting against the Moon Dwellers, after seeing one of her friends perish protecting her from them, her character embarks on a change into maturity, with a much more serious demeanour than before. In the final episodes of the show, she even reflects on her past self, stating that she was jealous of her immaturity, reflecting in her change of character as a result of the harsh reality of the world. Phos character, while perhaps coming across as maybe rather obnoxious, especially in the beginning of the series, was still able to make me laugh a numerous amount of times and I could excuse most of it on the grounds of her age and lack of knowledge about the world. Her character is pretty reltable as well, since we too have been in postions where the world seems to treat you like a child, and that feel of wanting to desperately grow into maturity is one Phos manages to encapsulate rather well. She is also pretty damn likeable, I would argue anyway, which helps the audience to become more invested in her character from the get-go, and the mental trauma and hang ups she faces in the latter half of the series is genuinely interesting. Much of Phos’s drive in the narrative, mainly in the earliest parts of it anyway, was her desire to help a fellow gem by the name of Cinncibar, a gem who secluded herself away from the rest since her body secretes a poison. While you may find yourself kind of frustrated at first since this plot point is kind of negated for a while, it does see some kind of resolution in the final episode of the show. Another character whom gets a nice amount of development is Dia. Aside from being best gem in the series (seriously, I wanna hug her so damn bad) Dia’s development, and character arc in general is all about proving to herself, and to the person whom she loves, that being Bort, that she is more than capable of looking after herself and in the tenth episode of the show, there’s a wonderful moment where indeed she does do so, when fighting off against one of the new Moon Dweller types, cementing her character as one that is grounded in the narrative, and has a lot of emotional weight behind her too, so much so, that I generally care for her whenever she is in danger or feeling melancholic, and many of the characters presented in the show are like this too. Whilst many are fairly simplistic, again, they feel like genuine people in this world, and have enough in the way of distinguishable personalities to carry the emotional weight of the show, while also showcasing different levels of complexity and depth, such as in the case of the Doctor of the gems, who we learn later on pursues the art of the gems in order to help her long lost friend, or in the case of Antarcticite when she hugs the sensei, believing nobody is standing there to see her do so, revealing a softer side to her character than we were led to believe at first. The characters in this show are easily the strongest element and is the main reason why I had so much fun watching this show. In terms of animation, Houseki is pretty damn solid overall! The CGI in this show looks damn amazing, and move with not only a lot of fluidity, but also quality too. They move gracefully when in combat, and it never comes across as jarring or clunky in the slightest. I also just love the designs for each of the gems too, in particular, their hair. I love the way in which it sparkles, gently illuminating the gems’ uniforms, with perhaps Dia looking the greatest in that regard. The fight sequences are also of a damn great quality, with dynamic and interesting cinematography, and just the way the grass is animated too, and how beautiful it looks, are all small things that I can appreciate, and, again, help the world feel more alive and vibrant. The OST for the show as well does a fantastic job at immersing me into this world, with its often whimsical and mystical tone, complementing the sense of ambiguity the narrative tends to encapsulate. The opening track as well does a great job at capturing the feel of the show, mainly used to represent the loneliness and isolation of Cinncibar to master fall affect.